Former Trump campaign adviser George Papadopoulos has been sentenced to 14 days in prison for lying to the FBI. Papadopoulos said he made a “dreadful mistake” and was eager for redemption. He is the first former campaign aide to be sentenced in special counsel Robert Mueller’s Russia investigation. 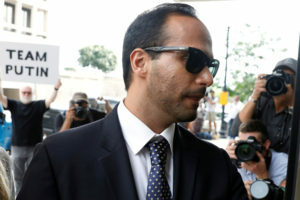 Papadopoulos apologized for his actions, telling a judge that he had made a “dreadful mistake” and was eager for redemption. Prosecutors sought a sentence of up to six months, while defense lawyers asked for probation. His case was the first to detail a member of the Trump campaign having knowledge of Russian efforts to interfere in the 2016 presidential election while it was ongoing. As elections approach, what is the risk of Russian meddling?